The Illuminati have emerged yet again. We last interviewed the band back in 1999 for one of the earliest issues of EAR CANDY. However, despite having a new CD out, the band has gone stealth. There is no Illuminati website. 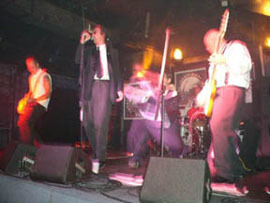 Photos of the band are often blurry. Requests for phone interviews were denied (fear of wire-taps?). The band did agree to do an interview...however, it was only by e-mail with the questions pre-screened (some of the questions were sent back with "no comment"). What follows is the often-bizarre correspondence with one of the world's most mysterious bands. E.C. : I noticed in the unclassified pictures of the band playing live that there are TWO bass players. Is this a decoy attempt by the band not unlike the CIA's "second Oswald" that showed up at the Soviet embassy in Mexico City in the early sixties? Illuminati spokesperson: There are MANY members not pictured. Surely you don't believe that your ruling elite is composed only of the 5 members pictured on the CD? Further information is given on a need to know basis. Suffice to say that the Illuminati always has a "Plan B". E.C. : I also noticed that there is not an official Illuminati website. Is this intentional? Do you not want your I.P. address revealed to the government? Illuminati spokesperson: We ARE THE GOVERNMENT. The "leaders" you see in the media - Bush, Blair, Putin, etcetera., are mere window dressing. They are the useful curtains that cover what really goes behind closed doors. E.C. : Was a programmed assassin used to 'eliminate' RFK and John Lennon? John Lennon = Mark David Chapman only completed the campaign of Lennon's destruction that Yoko Ono had started since her appearance. Yoko is someone who understands the principles of the illuminati. E.C. : Did the Illuminati control the outcome of "American Idol"? Is Simon on your payroll? Illuminati spokesperson: We control the outcome of everything. E.C. : Is the Illuminati the 'future' of pop music? Illuminati spokesperson: Pop music has no 'future'. It is mere window dressing designed to keep the masses in line. E.C. : If the Illuminati are as powerful as you have alluded, why haven't they disposed of such lesser artists as Britney Spears or any of the psuedo-punk bands? Illuminati spokesperson: See the answer to the previous question. E.C. : Why the delay in the release of the CD? Illuminati spokesperson: It's all about timing. The recent change in the masses after 9-11 made the release of the CD appropriate.. "Total Illuminati Awareness" is a celebration of the willingness of the masses to hand over the pale remnants of their "civil rights" to fight the boogeyman of "terrorism" who needs an army or socially conscious pop stars when the masses are so willing to become thralls so easily? E.C. : What have you guys been up to since our last interview? Illuminati spokesperson: Read the papers friend: TIA, Homeland security acts I and II. Things are moving along quite nicely; ahead of schedule. Illuminati spokesperson: The illuminati is the power elite first and a band second. Bands come and go but power is forever. E.C. : Favorite songs on the CD? E.C. : What is the future plans of the Illuminati?